When children hear stories without illustrations, they learn to use their imaginations to paint their own pictures. Not only is this is the first step towards learning how to make a personal connection to literature, children love listening with the freedom and power of their own minds. The stories on this CD are sweet, wholesome and magical. They give pre-schoolers and kindergartners a perfect opportunity to practice the capacity of inner-picturing that leads to good reading comprehension as they grow. Plus, they are fun! 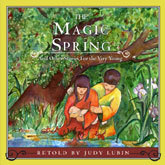 The Magic Spring; Lizard and Coyote; Silly Juan; A Present for a Princess; The Four Seasons; Sweet Porridge; The Blue Coat.